I’m not going to write a tribute to Ellie Greenwich, because I don’t know enough about her or her body of work to do justice to either. Ask a woman who was 13 to 16 years old when “And Then He Kissed Me” was a hit how important that song was to her. The Simpsons’ Matt Groening is right: There is no lower form of intelligence than a pop music critic. 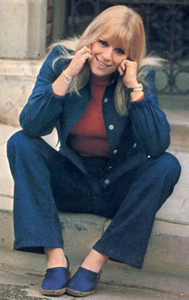 I’m here today to publicly thank Ellie Greenwich for not suing me. In 2002, the Enron scandal broke. As I read about all those people whose lives were ruined by greedy, thieving bastards who would do anything to obtain and keep their private jets and multiple mansions, I became infuriated. Livid. Filled with rage. When you’re a writer, being filled with rage often is not a bad thing. Me, I had to say something. Even if I didn’t have an audience. The idea popped into my head, I wrote it on a scrap of paper on Saturday, produced it on Sunday, and made it available to my Radio Programming Letter subscribers and website visitors on Monday. I used “Da Doo Ron Ron” as the framework. Note that I didn’t say “parody,” because it’s not a parody. Making and distributing the recording violated copyright law — no question. Huh? Don’t radio people do that all the time? Yeah, and most of the time they’re violating someone’s copyright. Here’s the short version: To qualify as a parody under the “Fair Use” doctrine, the new work must directly comment on either the original work or on the artist(s) who created the original work. My little protest didn’t comment on “Da Doo Ron Ron,” The Crystals, or the songwriting team of Barry & Greenwich. (Phil Spector, slimy even then, produced the record and demanded a songwriting credit, so he’s officially listed as a co-writer.) I don’t care what you’ve been told; it’s a copyright violation. Trust me. I actually wrote the book about that topic. A short time later, a friend of mine began collaborating with Ellie Greenwich on a theatrical project. He played my little rip-off for her. I was told, to my great relief, that when she heard it she laughed. As far as I know her co-writer and former husband, Jeff Barry, never heard it. But he was a special guest at one of my PD Grad Schools, a really nice guy, and…He’d never hear it anyway. Thanks for the great (and good and, occasionally, lightweight but fun) songs, Ellie & Jeff. Meanwhile, here’s the little ditty that Ellie was kind enough to not sue me for. The sad thing is because of the arcane nature of ownership rights the music label and Phil Spector’s company could have claimed ownership and sued you. Case in point being the famous My Sweet Lord lawsuit. According to what I’ve read about the case the lawyer who brought the suit against George Harrison may not have actually been working for the people who composed He’s So Fine – the song the suit claimed Harrison ripped off for My Sweet Lord. Not to mention that Phil Spector was the producer of George’s recording as well as He’s So Fine and if anyone should or could have complained about song similarity you would think that it would have been him at the time George wrote it. Eventually Harrison successfully had the suit overturned but it certainly proved just how insane many of the music ownership claims can be, especially from the early days of rock music. Very clever lyrics that certainly wouldn’t work if not for the original ‘art’ from Ellie. This sort of creativity was more common in the past. And yes, I’m sure one could argue that the pop music industry ‘ripped off’ or perhaps ‘failed to compensate’ any number of writers and musicians years ago. However, I believe what you did was not a ‘crime.’ To move quickly to create a ‘topical’ programming element couldn’t or wouldn’t be done if you had to negotiate ‘rights’ before proceeding. Was the original work ‘damaged’ by your work? Hardly. In the end, I’m glad it all worked out. However, in today’s ‘sue-happy’ climate, it’s doubtful that someone would do what you did now. I was a disc jockey when “My Sweet Lord” was released, and I immediately recognized the melody was virtually identical to that of “He’s So Fine.” I actually played the two songs on the air, back to back, to demonstrate that point. Nothing against George Harrison. I thought it was a terrific record. But it was the same melody, and it was a copyright violation. The lawsuit was filed as soon as the LP was released, and Harrison immediately offered a financial settlement. Speaking from afar and without any inside knowledge, I’d guess it’s because although he didn’t deliberately appropriate the melody, when the suit was filed he recognized that the “similarity” was so great that it would be difficult to defend in court. To say I loved her songs is an understatement. She was brilliant! (Except for all those Neil Diamond songs…at least she got him to sing instead of “talk” through them!) I even married a girl from Long Island named Ellie! Well done, Dan. 🙂 The skewering was more effective because the music was well-known. Glad Ellie laughed because of the “tribute” and not all the way to the bank because she decided to sue.